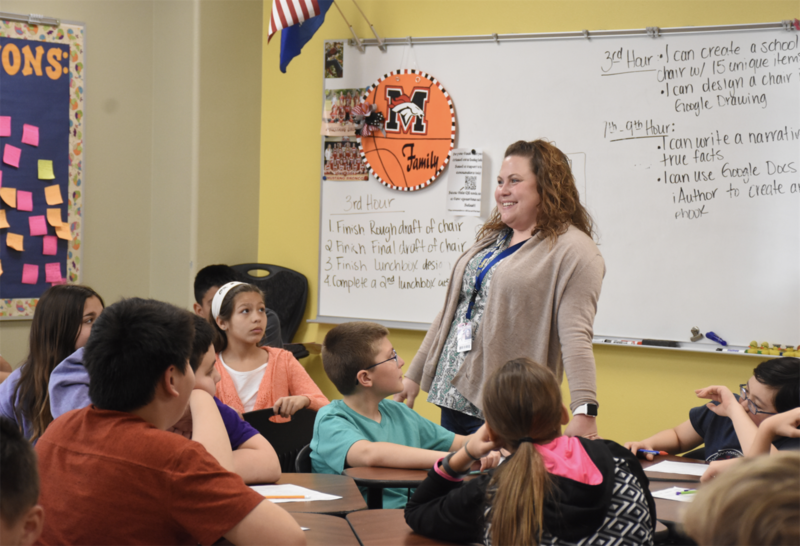 Canyon Ridge Intermediate’s Teacher of the Year, Jessica Wilkes, took a circuitous route to to Mustang Public Schools. She tried a degree and then careers in the business sector more than once, but her heart was never in it. After 10 years in education, she knows every day is an opportunity to make a difference, to change a life. Wilkes went to the University of Florida and majored in business, but a semester into the year she found the coursework bland. Wilkes is the niece of longtime Mustang Middle School Principal Linda Wilkes, who retired in 2013. Wilkes changed majors. She earned a bachelor’s in elementary education and a master’s in elementary education with a specialization in literacy. She was hired to teach half-way through the year in Jacksonville, Florida, taking over for a teacher who had a stroke right after the year started. For the first semester, long term substitutes would stay a week, maybe a week-and-a-half and then quit because the kids were so hard to handle. One student in particular refused to be reasoned with. Wilkes was coming out of college and had no procedure for discipline. A veteran teacher in the building told her if she could just make it through this half of the year, if she could conquer this one child, then she could teach anyone, anywhere from then on without fear. Wilkes took the time to figure out what the boy’s interests were. He liked soccer, so she refereed school-yard games at recess. Gradually, his behavior improved and the days were consistently better. After four years in Jacksonville, she decided to move home to Oklahoma. Wilkes got a job at a highly diverse inner-city school with a 98 percent free and reduced lunch rate. She loved it. The principal was fantastic, but moved to a different position at the end of the year. The administration that followed struggled to understand the special needs that come with a population that diverse. Wilkes left education for the business world, but the teaching bus never left. “Driving home every day, knowing all I did was work on a spreadsheet or make graphics for someone else’s presentation was disheartening,” she said. Although she found no reward in the job, she had made a commitment and was going to stick with it. But Aunt Linda had a plan. She needed help handing out schedules to parents at Mustang Middle School. Her niece couldn’t tell her no. Wilkes handed out schedules, talked to parents and by the end of the evening knew she wasn’t done with teaching. “Let me show you where your classroom would be,” Principal Wilkes said, leading her down the hall. The room had large windows, carpet and the promise of something rewarding. The answer was easy. A fellow teacher told her, though, if she ever had a chance to be on the staff that opened a building she should do it. When Canyon Ridge Intermediate opened, Wilkes said goodbye to MMS and went with new Principal Kathy Blackwell. “I have never worked under a principal more caring or more dedicated or genuine than Kathy Blackwell,” she said. Moving from sixth through eighth grade to fifth and sixth at the intermediate level was definitely a change. For Wilkes, that’s part of the charm of education. There is somewhere for everyone who wants to teach. This year Wilkes teaches communications, the Ridge Rockers leadership class and then Gifted and Talented Education for fifth graders in the afternoon. The best email she’s gotten this year was from one of the school counselors. Wilkes had her students write about a struggle they were having in their classroom journal. The girl’s story caused Wilkes enough alarm that she passed on her concerns to a school counselor. Although the girl didn’t know how to ask for help, she knew Wilkes would ask for her. Wilkes is one of 14 site Teachers of the Year for Mustang Schools. A District Teacher of the Year will announced at a special banquet in March.